Amid the fuss over a Google buyout, Groupon’s expanded its global presence with acquisitions of its own and boosted the service it offers clients. How will these moves improve Groupon, and are they designed to aid the purchase by Google? Amid the fuss over a Google buyout, Groupon’s expanded its global presence with acquisitions of its own, and boosted the service it offers its clients. How will these moves improve Groupon, and are they designed to aid the purchase by Google? Make no mistake about this–it’s a big thing. It moves Groupon beyond the “deal-a-day”-centric system it’s been following, and gives its merchant partners control over when and what deals they serve-up–Groupon thus becomes the clearing house for its merchant’s deals, promoting them as and when they pop up, rather than the “custodian” or manager of the deals. In some sense this is a good thing since it means consumers can get better deals more often, but it does potentially allow for some of the over-enthusiastic deal disasters we’ve seen before. At least Groupon’s new role allows it to distance itself a little from such dangers. Next up is the “Deal Feed.” This is like a Facebook wall of deals, “personalized for you” with Groupon’s profiling algorithms from the swathe of new deals that will become available through the new Store. It’ll have a featured daily deal, deals from merchants you follow, and recommended matches from other vendors. In the future it’ll actually tie up directly with Facebook, so you can see what your friends are up to on Groupon–potentially creating the opportunity for very popular deals to go viral. Both these moves are significant for Groupon’s future, since they place more emphasis on multiple merchants and a more hands-on user experience than before, and they allow Groupon to embrace many more vendor deals. Meanwhile Groupon’s exec team has been busy in Asia, and has just announced it’s bought uBuyiBuy, Beeconomic and Atlastpost for unrevealed sums. This gives Groupon instant access to millions more users in Asia (Atlastpost alone has over a million subscribers in Taiwan). 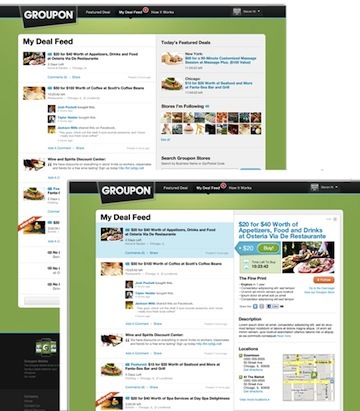 The sites are existing discount offering sites, so while they aren’t exactly the same as Groupon, they operate in the same marketspace–and buying each will also give Groupon access to their lists of vendor partners, which will only boost its revenue opportunities. Groupon also launched new localized services in Hong Kong, Singapore, Philippines, and Taiwan today–proving its exceptionally keen to embrace the high-tech purchasing habits of Asian consumers. According to reports Groupon’s executive team is meeting today to discuss the details of the supposed $6 billion buy-out offer from Google–if rumors prove true, we can probably expect a flurry of news on the matter later on. So maybe the timing of two pieces of news coming from within Groupon are no surprise–they’re an attempt to clear the baffles so that there are no “extra” surprise pieces of news arriving to confound or confuse the message about Google’s purchase (and maybe even to add extra perceived value to the firm as part of a bargaining gambit). The moves to expand the services it offers turns Groupon’s shopping experience into something richer than it was, which may be complementary to existing Google shopping plans, and the fact the company is expanding very swiftly into new markets–including by expensive acquisitions–is a nice proof that its business model is viable, and that it has cash to spare. This is a nice way to boost the asking price of the firm.